What could be better than reconnecting with an old friend, the best friend you’d ever had? That was exactly how Mel thought when she opened Abi’s email. They’d have a chance to erase all the years between them and make things good again. For a while, they were. But then, everything went to hell in a handbasket. 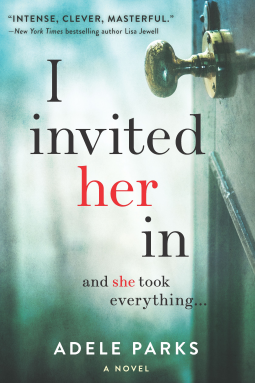 I Invited Her In is exactly the kind of thriller I enjoy. Best friends coming together after years apart only to uncover secrets piled on top of secrets. And let me tell you, both Abi and Mel have boatloads full of secrets between them. Melanie was easy for me to relate to. While I wasn’t a teenage, single mother, I am the mother of two girls, one of which is the same age as Liam. That put me in a place where I could easily understand her rage, her fear, her desperation. Even when she overreacted and was over the top, I still got it. That drive to protect your kids at all costs is a strong one. Abigail, on the other hand, I did not understand at all. Mostly because I wasn’t ever the popular, glamorous type. But she’s also very self-absorbed and you see this from the very beginning. In the way she never offers to help, constantly monopolizes Mel’s time, and other things. I thought I’d give her the benefit of the doubt but, instead of growing to like her, I wound up despising her. Which was probably the point, but that’s something else entirely. I did feel some pity for Abi, however, but her actions were way above and beyond the hurt she was feeling. I’m a very gullible reader, I’ll admit to that. When everyone else sees the ending coming, I’m taken by surprise. That’s okay though, I can live with being gullible in a fictional world. However, I knew this book would have some kind of twist at the end and I was not expecting either that we got. The first, I had some inkling that something would happen, I just hadn’t expected it to be that. The other though? I was definitely shocked, although I probably shouldn’t have been. I Invited Her In was slow to start but, once you get to the meat of the story, it takes off from there. As soon as I found out what was really going on, I was hooked. And that’s when the wheels come off and all the secrets start to pour out. I wish that the author had given some of these tidbits earlier on. Even hinting at some of them might have made the first part of the book move a little faster. However, I stuck it out and am not sorry that I did. What a wild ride this novel was! *Thank you to Netgalley, the authors, and the publisher for a copy of this book in exchange for an honest review.